Though fragile in appearance, and evidently nearing his end Father Gallitzin was never absent from his post on Sundays. His voice was still strong, clear, and beautifully modulated, his glance keen, his interest in affairs of Church and State as lively and decided as in his earlier days of warfare. 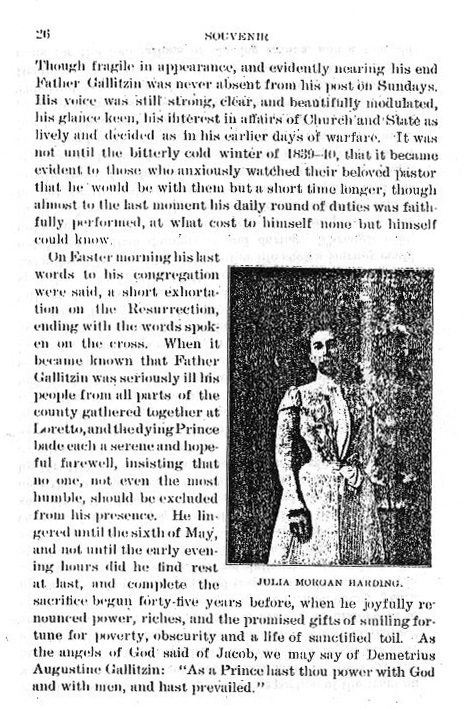 It was not until the bitterly cold winter of 1839-40, that it became evident to those who anxiously watched their beloved pastor that he would be with them but a short time longer, though almost to the last moment his daily round of duties was faithfully performed, at what cost to himself none but himself could know.